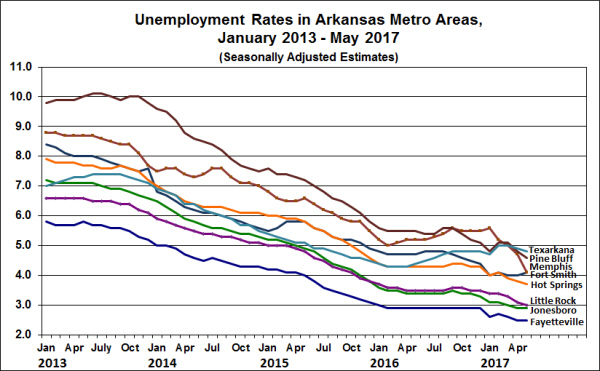 Unemployment rates in Arkansas metro areas remain lower than a year earlier. Wednesday’s news release from the Bureau of Labor Statistics noted that year-over-year changes in unemployment rates show declines in 323 of the nations 388 metropolitan areas, with all of Arkansas metros included in that total. Recent monthly changes in unemployment rates have indicated a leveling-off, with most of the declines since August 2016 having taken place in the final months of 2016. As previously reported, Arkansas’ statewide unemployment rate ticked up one-tenth of a percentage point in August, with the increase attributable to the first notable increase in the number of unemployed Arkansans since 2011. Unemployment rates in the state’s metro areas generally followed the same pattern. An increase in the number of unemployed was reported each of Arkansas’ metro areas except Memphis. The increases were large enough to push unemployment rates up in Fayetteville, Fort Smith, Jonesboro, Little Rock and Pine Bluff. Nonfarm payroll employment in Arkansas metro areas also followed the statewide pattern of a downturn in August, with payrolls declining in four of the state’s metro areas. Declines were particularly pronounced in the rapidly growing northwest and northeast corners of the state, where recent employment growth trends have been the highest. 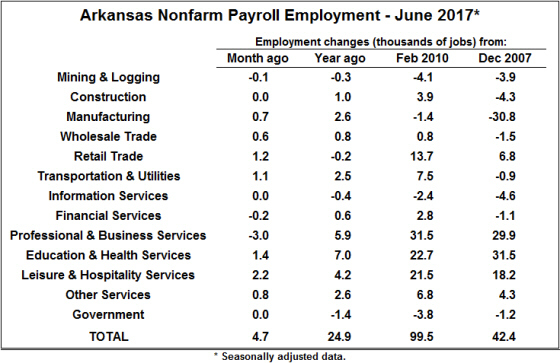 Payroll employment in Fayetteville was down 0.4% from July to August, but remained up 3.0% from a year earlier. In Jonesboro, the monthly decline registered 0.5%, leaving employment 1.6% above its August 2016 level. July data on employment and unemployment in metropolitan areas showed that unemployment rates were lower than a year earlier in all Metro areas covering parts of Arkansas. Year-over-year changes in not-seasonally adjusted data range from -0.3 percentage points in Northwest Arkansas to -0.9 in Memphis and Pine Bluff. Unemployment rates were unchanged or down slightly from June to July for most metro areas, although the Memphis metro area (which includes one county in Arkansas) saw an increase of 0.2 percentage points in July. Rates were down in Fort Smith, Pine Bluff, and Texarkana. Nonfarm payroll employment show wider variations among metro areas than do the data from the household survey. From June to July, payroll employment was unchanged in Little Rock, Memphis and Pine Bluff. Employment was up Fayetteville, Hot Springs and Jonesboro, while Texarkana saw a decline. 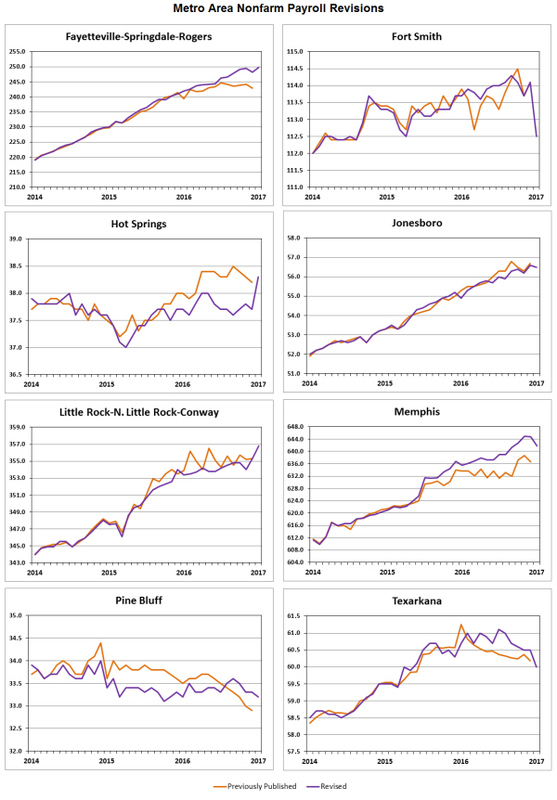 From July 2016 to July 2017, Fayetteville, Hot Springs, Jonesboro and Memphis have experienced net growth, while the year-over-year changes were negative for Fort Smith, Pine Bluff and Texarkana. 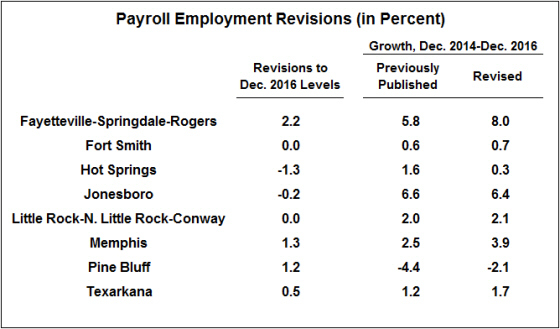 Payroll employment in the Little Rock Metro area was unchanged from a year earlier. The latest report on state level employment and unemployment showed another strong month for Arkansas. The unemployment rate remained unchanged at the very low level of 3.4%, and remains 0.9% lower than the national average. The underlying components of the unemployment rate have also continued to suggest a strong job market: The number of unemployed was essentially unchanged in July but has declined by over 6,000 since the end of 2016. Meanwhile, the household survey shows an increase in the number of employed Arkansans of over 43,000 in 2017 — with a gain of over 35,000 in just the most recent four months. The household employment gains reported over the past four months are extraordinary, and if taken at face value reveal record-breaking employment growth for the state. 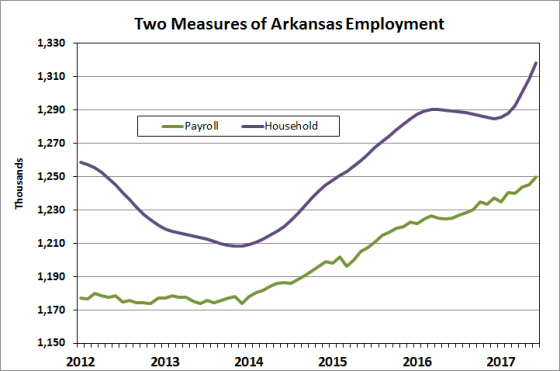 Looking over the entire history of the data for Arkansas (1976-present), the four largest monthly changes in household employment have taken place in April, May, June and July of 2017. The situation is reminiscent of early 2016, when the originally-reported monthly employment gains were equally incredible. The magnitude of the 2016 increases was significantly reduced when the data were revised earlier this year, and we expect similar revisions to the 2017 data when all is said and done. What accounts for the rapid growth in employment? Mathematically, the new employment is reflected in a higher labor force participation rate. 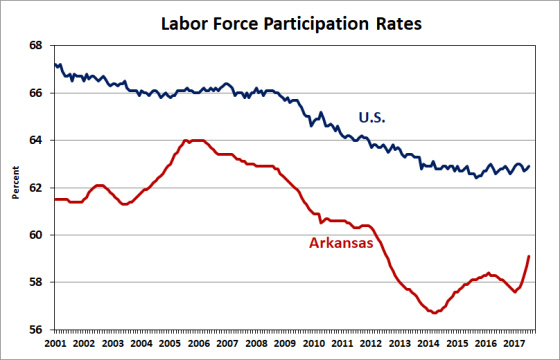 As shown in the chart below, Arkansas suffered a sharp decline in labor force participation during the slowdown of 2012-13, declining from 60.4% to 56.8%. That represents a decline in the number of Arkansans who were either employed or looking for a job amounting to 3-1/2% of the state’s working age population. The surge in employment thus far in 2017 is matched by an increase in participation, indicating that many of the workers who had left the labor force during the 2012-13 doldrums are either returning to find jobs, or are being replaced by a surge of new entrants. Either explanation supports the conclusion of favorable conditions for job-seekers. The magnitude of recent increases in labor force participation are just as extraordinary as the rise in household employment. From January through July, the participation rate has increased from 55.4% to 57.1%. Once again, it is unlikely that the magnitude of this increase will withstand future data revisions. Nevertheless, there is good reason to believe that the statistics are revealing more than just statistical noise. The independent payroll survey has been showing strong employment growth during 2017 as well (as described in more detail below). The two measures of employment are not defined precisely the same way and are collected using different sources and methodologies, so when both are indicating similar patterns of job growth, our confidence in the overall trend in market conditions is enhanced. From June to July, Nonfarm Payroll Employment increased by 6,100 jobs (seasonally adjusted). 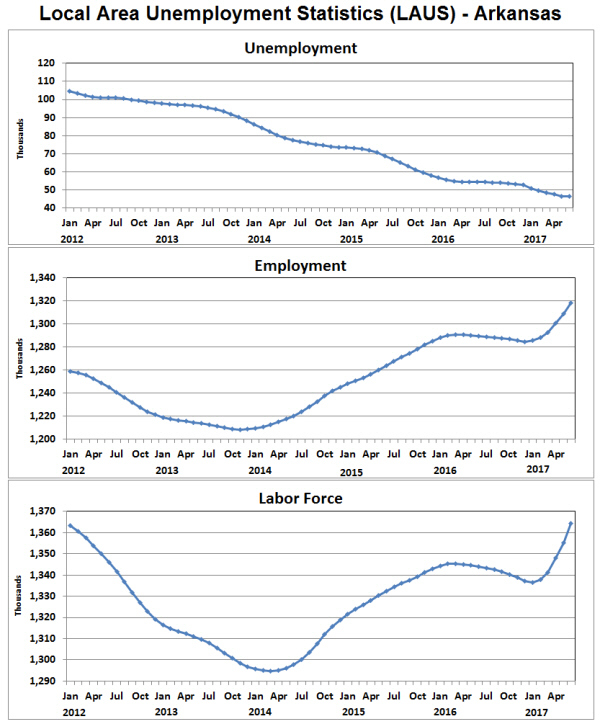 Moreover, the data for June were revised upward by 3,900 jobs, raising the May-June increase from +4,700 to +8,600. Over the past 12 months, payroll employment is up 32,700, or 2.7%. The monthly news release from the Bureau of Labor Statistics noted that Arkansas’ year-over-year employment growth rate was among the highest four in the nation (a virtual three-way tie for second place). Monthly employment gains – as well as year-over-year changes – have been spread across a wide range of sectors. Service-providing sectors continue to account for the bulk of total job growth. The three fastest-growing supersectors (Professional and Business, Education & Health, and Leisure & Hospitality) have accounted for nearly two-thirds of the net job creation over the past year. We’ve also seen growth in goods-producing sectors in recent months: Compared to July 2016, Construction employment is up by 1,600 and Manufacturing is up 3,900. If we compare July’s employment pre-recession levels (since the end of 2007), Arkansas employment has increased by 52,400 jobs, or 4.1%. In comparison, nationwide employment has increased by 5.9% over the same period. 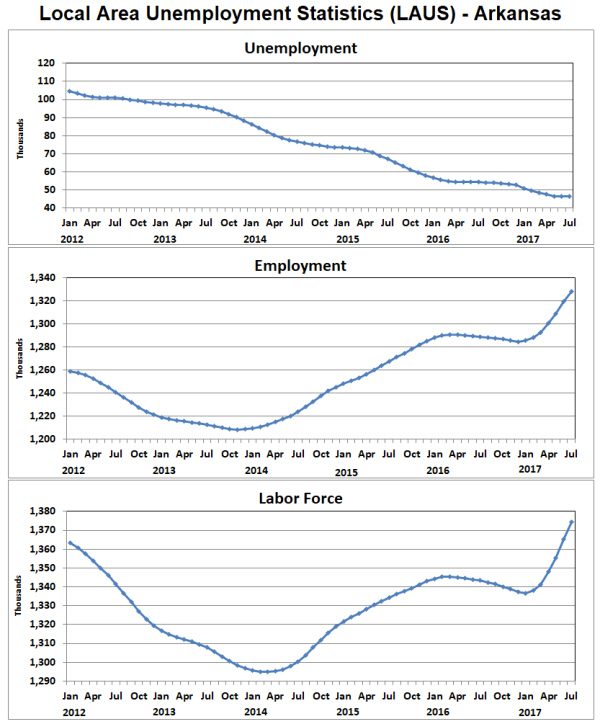 *Seasonally adjusted data for Arkansas nonfarm payroll employment, reported in a format compatible with the monthly news release from the Arkansas Department of Workforce Services, can be found here: Table-Seasonally Adjusted NFPE. The Bureau of Labor Statistics reported this morning that unemployment rates were lower in June than a year earlier in 336 of the 388 metropolitan areas in the U.S. All of Arkansas metro areas, except Texarkana, fell into that category. With an unemployment rate that is up 0.3 percentage points since June 2016, Texarkana was one of 45 metro areas with a higher unemployment rate than a year ago. From May to June, seasonally adjusted estimates indicated that unemployment rates were unchanged or up slightly in most of Arkansas metro areas. Texarkana was the outlier in this comparison as well, with an unemployment rate decline of 0.1 percentage points. From May to June, nonfarm payroll employment increased in Little Rock, Memphis and Fort Smith. 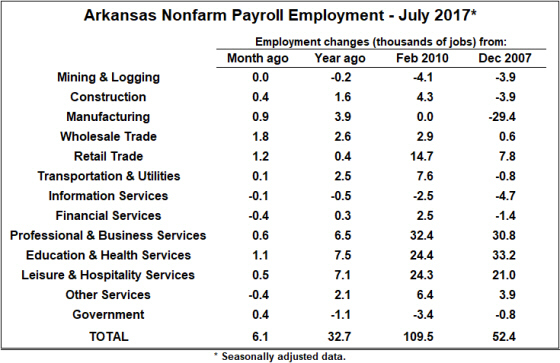 Payroll employment was down in Hot Springs, Pine Bluff, Texarkana and Fayetteville. Compared to a year earlier, Fayetteville remains the fastest-growing metro area, up 3.8%. 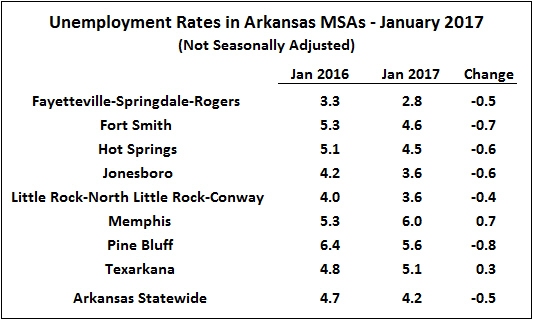 Jonesboro, Memphis and Hot Springs had employment totals that were also significantly higher than a year earlier. The figure below illustrates the wide range of employment growth patterns over the past decade. 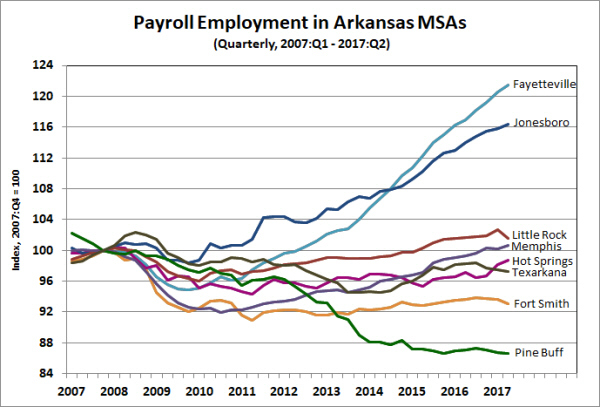 Only four of Arkansas metro areas have higher employment totals than at the start of the 2008-09 recession and only Fayetteville and Jonesboro have experienced significant growth. Since the employment trough of 2010, most of Arkansas metro areas have experienced at least some positive growth, with the exception of Texarkana and Fort Smith (both essentially unchanged) and Pine Bluff (down nearly 11%). Arkansas’ unemployment rate was unchanged at 3.4% in June. The national average rate increased by 0.1 percentage point to 4.4% for the month, so the gap between Arkansas and the U.S. has widened to a full percentage point. The data series underlying the unemployment rate continued to show movement in a positive direction: The number of unemployed Arkansans declined by 238 while the number of employed increased by 9,481. 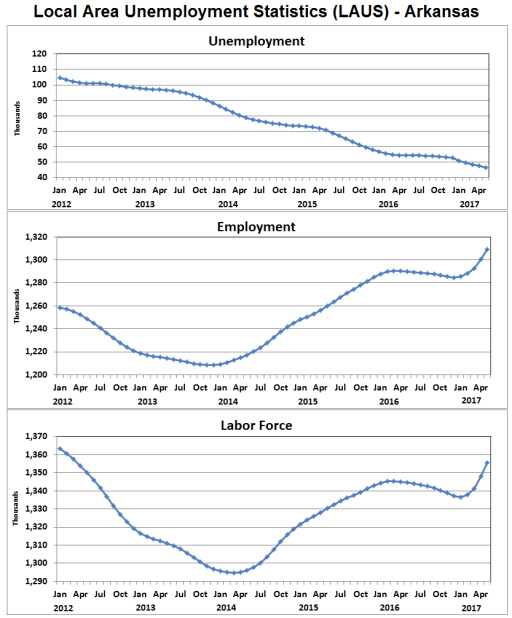 As a result, the labor force increased by 9,243 for the month. 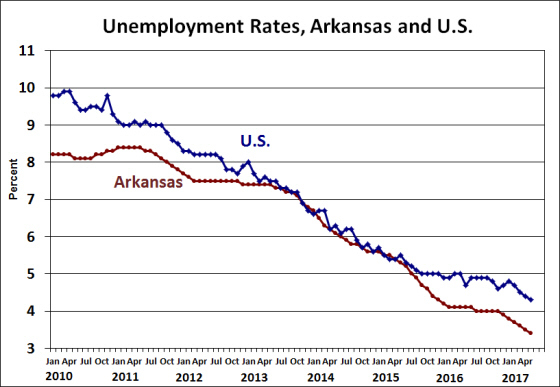 There is reason to believe that some of the recent declines in Arkansas’ official unemployment rate might be overstating the actual fall in unemployment. Since the beginning of 2017, the household survey has shown the number of employed rising at an unprecedented rate — expanding at an annual rate of over 5 percent since December 2016. Comparing the household data to the payroll survey, it appears likely that this rapid pace of household employment growth will ultimately be revised downward. As illustrated in the figure below, the employment measure from the household survey has grown by 33.6 thousand over the past six months, while the payroll survey shows job growth of only 12.5 thousand. Although the two measures of employment have slightly different definitions, they should generally be expected to move together over time. Of the two, it is typically the household measure that is subject to more substantial annual revision. 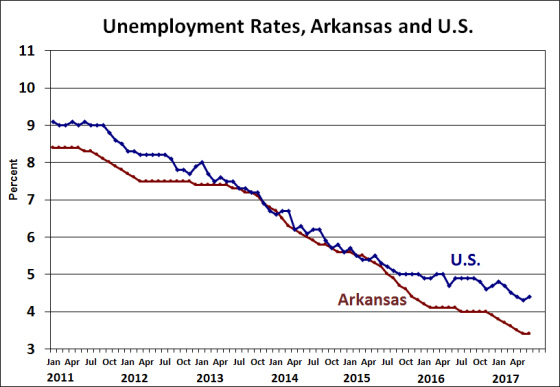 If a downward revision to the household employment data does eventually take place, then the exceptionally low unemployment rate recorded in Arkansas this year would be revised upward. However, the magnitude of the adjustment to the unemployment rate would be relatively small. Even taking into consideration the imprecision of the data, Arkansas unemployment rate is statistically significantly lower than the U.S. average. So in the worst-case scenario, Arkansas’ true unemployment rate is closer to 4% than to 3.5%. 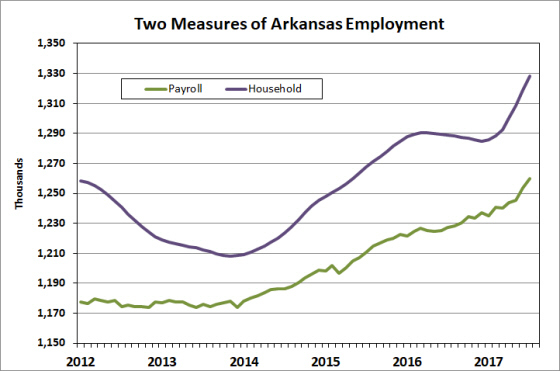 And the conclusion we can draw from examining both data sources is that Arkansas employment has been expanding at a healthy pace for the past 3-1/2 years, with no reason to expect a change in that trend. Turning directly to the payroll survey, Arkansas’ nonfarm payroll employment expanded by 4,700 in June (seasonally adjusted). The sector recording the largest gains was Leisure and Hospitality Services (+4,200), with most of the gain attributable to Accommodation and Food Services (+3,800). June is typically a strong month for employment growth in this sector, but the increase in the seasonally-adjusted statistics indicates that the growth was exceptionally strong. Other sectors adding jobs included Health Services and all sub-categories of Trade, Transportation and Utilities. Professional and Business Services dropped by 3,000 jobs, with most of the job losses in the category of Administrative and Support Services. Compared to a year ago, Arkansas payroll employment is up by 24,900 jobs — an increase of 2.0%. That rate of job expansion puts Arkansas on the list of 33 states that have experienced statistically significant employment increases over the past 12 months. In fact, Arkansas ranks #14 on that list. Service-providing sectors are responsible for most of that job growth, but gains of 1,000 jobs in construction and 2,600 jobs in manufacturing have also provided for net growth in goods-producing employment as well. In its latest news release on metro area employment and unemployment, the Bureau of Labor Statistics noted that unemployment rates “were lower in May than a year earlier in 298 of the 388 metropolitan areas.” Seven of the eight metro areas including parts of Arkansas fell into this category, with Texarkana being one of the nation’s 66 metro areas to have higher unemployment than a year earlier. Seasonally adjusted estimates showed unemployment rates were generally unchanged or ticked downward in May, with the exceptions being Fort Smith and Memphis. In Fort Smith, the rate ticked upward by 0.1 percentage point, while in Memphis the unemployment rate plummeted by 0.6 percentage points. The sharp decline in Memphis’ unemployment rate wasn’t associated with a commensurate increase in employment. Rather, the data show a 13.5% decline in the number of unemployed, along with a decline in the number employed. The reason for this sudden drop in labor force participation is not clear. Nonfarm payroll employment increased in five metro areas in May, declining in the other three. Pine Bluff saw a one-month increase in employment of 1.2%, bringing the total back up to the same level as a year ago. Little Rock’s employment ticked down 0.1% in May, and is little changed from a year ago. The fastest-growing employment markets in the state continue to in the Northwest and Northeast corners of the state. Employment in the Fayetteville MSA was up 0.8% in May, and is 4.3% higher than a year ago. In Jonesboro the one-month increase was 0.2%, corresponding to a 2% increase from May 2016. These two metro areas remain the only parts of Arkansas in which employment is significantly higher today than before the 2008-09 recession. Arkansas’ unemployment rate declined another tenth of a percent in May, setting a new series record low of 3.4%. With the U.S. rate tracking downward at the same pace, Arkansas’ unemployment rate remains nearly a full percentage point below the national average. Underlying data from the household survey has been showing very strong employment growth during 2017, particularly over the past two months. The number of employed was up 8,604 in May after increasing 7,887 (revised) in April. These recent increases are reminiscent of early 2016, when household employment increased by an average of 10,000 per month for three months. At the time, we were skeptical of the magnitude of those increases, and subsequent data revisions eliminated that brief surge from the record. With those large gains revised away, the increases from the past two months are far and away the largest monthly increases in the series’ history. The data clearly suggest that the number of employed is rising, but the magnitude of the gains over the past two months are eventually likely to look considerably smaller than the recently-released data suggest, once the final revisions are compete. Nonfarm payroll employment increased 2,900 in May (seasonally adjusted) and is up 22,000 compared to a year earlier. Goods-producing sectors were little changed, on net, with manufacturing down by 1,000 and construction up by 800. Employment gains in the service-providing sectors were concentrated in the rapidly-growing sectors of Professional & Business Services and Leisure & Hospitality Services. Health Services were down slightly in May, but employment in that sector is still up 4,800 from May 2016. 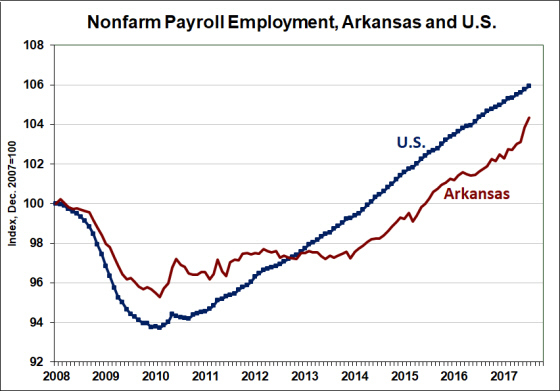 Over the past 12 months, the growth rate of Arkansas nonfarm payroll employment has been 1.8%, compared to 1.6% for the U.S. Arkansas total payroll employment is now 3.3% higher than its level just before the 2007-08 recession. Unemployment rates in Arkansas metro area continued their downward trend in April. The Bureau of Labor Statistics reported yesterday that unemployment rates were lower than a year earlier in 322 of the nation’s 388 metropolitan areas. Seven of Arkansas’ eight metro areas were included in this number. In Texarkana, where the rate has been drifting upward over the past twelve months, the unemployment rate was up 0.5% compared to last April. On a seasonally adjusted basis, unemployment rates ticked downward in all Arkansas metro areas except Fort Smith, where it was unchanged. The time series of seasonally adjusted unemployment rates shows convergence to three different levels cross the state. Texarkana, Memphis and Pine Bluff are clustered around 5%, Fort Smith and Hot Springs are at or near 4.0%, and Little Rock, Jonesboro and Fayetteville are at 3% or lower. Changes in nonfarm payroll employment were mixed around the state. Only Jonesboro and Hot Springs showed increases from March to April, while Fayetteville, Fort Smith, Little Rock, Pine Bluff and Texarkana experienced employment declines. Memphis was unchanged. Compared to a year earlier, employment has declined in Fort Smith, Pine Bluff and Texarkana. Fayetteville Jonesboro, Hot Springs and Memphis are up significantly, while Little Rock employment is essentially unchanged. Compared to employment levels before the 2008-09 recession, employment statewide has expanded by 3.0%. But that aggregate masks some huge differences among metro areas and regions. Employment levels in Fayetteville and Jonesboro are up 21.1% and 15.9%, respectively, while payrolls in Pine Bluff are down 13.8%. Data on unemployment rates for metropolitan areas are still in flux after recent revisions. Today’s news release featured new information for February and revised figures for January, but the databases at the Bureau of Labor Statistics have not yet been updated with revised historical data. 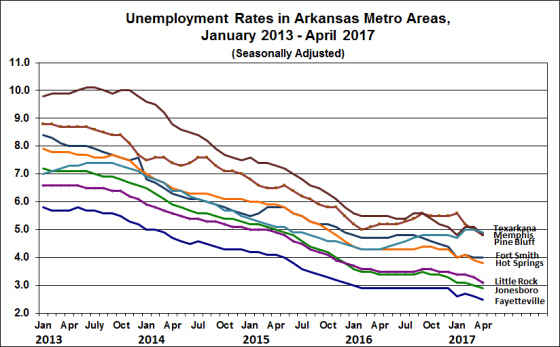 We do know that the not-seasonally adjusted data shows unemployment rates lower than a year ago in six of Arkansas’ eight metro areas. In Memphis and Texarkana unemployment rates are up slightly from February 2016 to February 2017. Although the statewide unemployment rate ticked downward in February (to a new record low), seasonally adjusted estimates for Arkansas metro areas indicate slight increases in unemployment from January to February. The unemployment rate in Memphis dropped by 0.4 percentage point and unemployment in Jonesboro was unchanged, but the other metro areas saw increases. The seemingly anomalous juxtaposition might just be noise in the data or reflect idiosyncrasies of the seasonal adjustment process — stay tuned for future revisions. 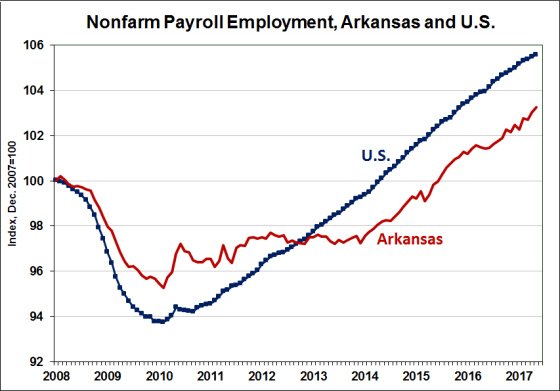 Nonfarm payroll employment was unchanged or higher in all of Arkansas’ metro areas. The two metro areas that have been growing the fastest during the current economic expansion saw significant gains: Jonesboro was up 0.9% from January to February and Fayetteville rose 0.8%. Texarkana, where job growth has been rather weak in recent years, saw a full percentage point increase in employment. Only three metro areas — Fayetteville, Jonesboro, and Little Rock — have seen net increases in payroll employment since the pre-recession peak of December 2007. The latest release on metro area unemployment rates included only selected data: Revisions to historical data and seasonal factors are in progress and will be included in next month’s report. For now, only the not-seasonally adjusted data are available. 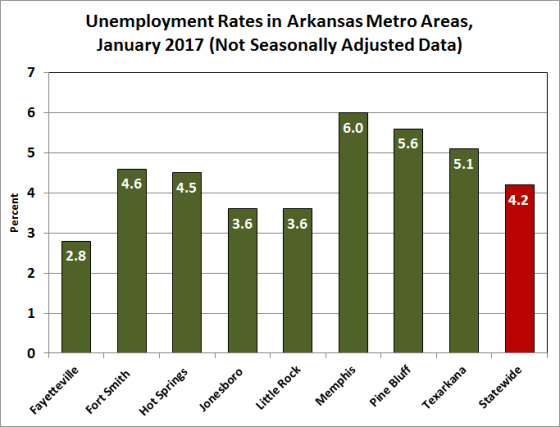 As shown in the following figure, unemployment rates vary considerably across Arkansas metro areas. Fayetteville, Jonesboro, and Little Rock have unemployment rates below the statewide average of 4.2%, while the remaining metro areas have rates that are above the average. From January 2016 to January 2017, unemployment rates declined sharply in most of the state’s metro areas, with the statewide rate declining by one-half of a percentage point. Two exceptions were Memphis and Texarkana, which experienced increases in unemployment rates over the 12-month period. Changes in nonfarm payroll employment were mixed across metro areas. One-month changes ranged from Hot Springs (+1.6%) to Fort Smith (-1.4%). 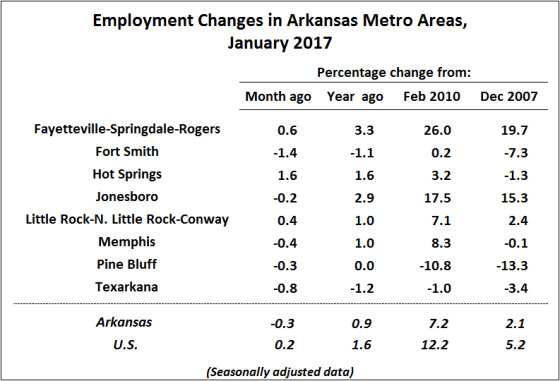 Compared to January 2016, employment was higher in five of the eight metro areas, but was lower in Fort Smith and Texarkana. The latest report included annual benchmark revisions to the payroll employment time series. The underlying not-seasonally adjusted data were revised back to April of 2015, with seasonal factors revised back five years. The revisions are summarized in the table below and displayed in the accompanying set of charts.